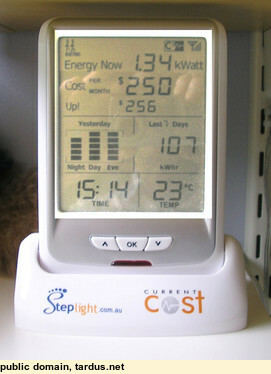 The CC128 ENVI Power Monitor is cheap and does work pretty well, with its wireless data transmitter connected to the house's main power switchboard. To get data out of it, I use the optional serial cable with its built-in USB convertor, plugged into my Debian Linux server. I adapted the following PERL script from one I found on the Net. It just sits passively waiting for serial data to arrive, ie, it sends nothing to the CC128. I expect the CC128 can receive signals, but my scheme does not use any. At intervals the CC128 dumps out historic data it has stored, and the script filters this into a separate history file, in case I ever have a need for it. #Original Perl code by Paul Mutton. #Updated for CC128 by Mark E Taylor. April 2009. # Reads data from a Current Cost device via USB/serial port. # modified 2011 by Tardus, to parse the data stream into "current" value and "history" value files. # hence cannot hard code it in this script. $ob->baudrate(57600); #For CC Classic use 9600 for CC128 use 56700. The script logic is to write any files longer than 240 characters to a history file, and shorter ones to a current power file. The history lines the CC128 pumps out at intervals are very long. For now I only use the current power values. Also, the calling script has to work out what the actual "ttyUSBx" port is and pass it to cc6.pl. At least with my CC128 the data output is quite dirty, with items dropping out of the xml text stream, and with frequent null characters (ASCII 00) being inserted. The calling script, plotPower1.sh, filters the rubbish out. The "^@" characters are nulls that don't belong here. Note to that the third line has lost the closing "</dsb>". The second line is OK.
echo "cc6 is NOT running"
echo `date` "latestHousePower.dat file just written"
What we want is exactly 18 white-space delimited fields, and exactly 153 characters. Anything else will be rejected by the getAverage.awk script. #	if corr is not specified it is forced to "1"
The 3rd field is the room temperature in degrees Celsius, the 4th is the standard rate power consumption in watts and the 5th is the off-peak power in watts. LABEL="Single (Standard) Rate Power Consumption - Watts"
LABEL="Off Peak Rate Power Consumption (Water Heating) - Watts"
LABEL="Total Power Consumption - Watts"